1. Preheat oven to 350°F (180°C). In a large bowl, combine eggs, garlic, green onions, herbs and milk. Season with salt and pepper and mix well. Set aside. 2. 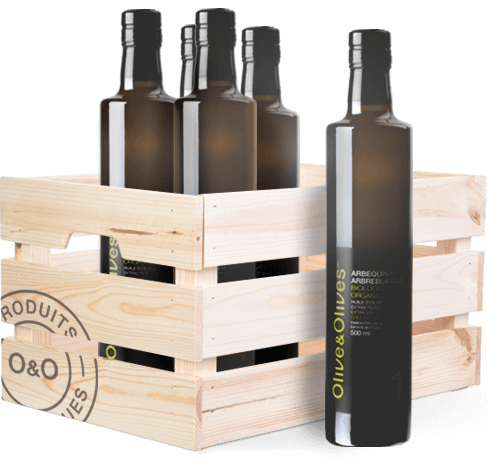 In a 12-inch (30 cm) cast-iron skillet (do not use a non-stick pan), heat extra virgin olive oil over medium-high heat. Add onion and potatoes and season with salt and pepper. Sauté until lightly golden and tender, stirring occasionally, about 8 to 10 minutes. If mixture begins to stick, add a tablespoon or two of water. Stir in peas and cook for another 2 minutes. 3. Turn heat up to high. When the skillet is very hot, add egg mixture, then immediately reduce heat to low. (The frittata's success depends on the pan temperature.) 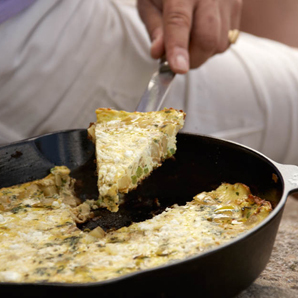 Let frittata cook untouched for a full minute so that it puffs up. Then run a spatula around the edges of frittata to expose uncooked egg to the bottom of the pan. Cook until frittata is beginning to set. Distribute goat cheese evenly over the top, cover with foil and transfer to preheated oven. Bake for about 20 to 30 minutes or until top is golden brown. Let rest 10 minutes, then cut into wedges and serve warm or at room temperature.